The most popular Spruce by any measure, Colorado Blue Spruce plug transplants are often the primary choice for Christmas trees, ornamental landscaping, privacy screens and windbreaks, and can reach heights of over 100 feet. It features a pleasing conical shape, and can live for up to 800 years. Colorado Blue Spruce needles are four-sided and can be quite sharp (“pungens” is Latin for “sharp”), and needle color varies from silvery blue to greenish blue. The Glauca variety (which we sell), tend to have more blueish and silvery needles. About 60% develop the famous “blue” color, while the rest will remain more greenish. It is a genetic trait which cannot determined for another few years. 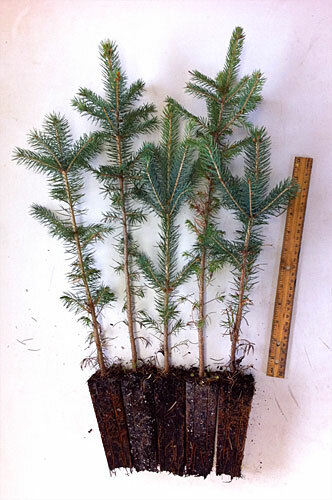 Colorado Blue Spruce plug transplants are very hardy, dense, and grow at an average rate for an evergreen. It’s cones are anywhere from 2 to 4 inches long and have a brown chestnut color. When mature, Colorado Blue Spruce plug transplants are anchored with a deep root system, protecting it from drought and high winds. It requires little pruning to maintain its shape, and retains its needles better than almost any spruce (handy when removing it from your home after Christmas). Colorado Spruce grow from Kentucky north (but can do well in lower states such as New Mexico and Arizona if planted at elevations above 5,000 feet) and east of Idaho. They can handle a little bit of shade, but full sun is best.